Cycle Sport December 2010 issue out now! 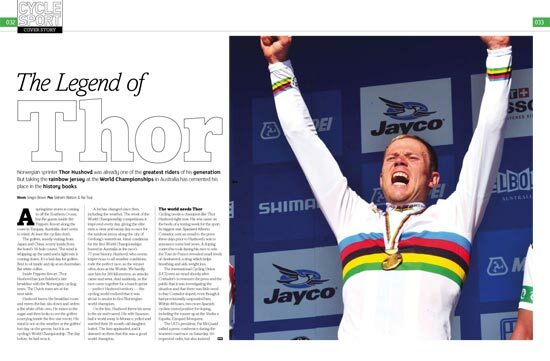 Our cover star is brand new world champion Thor Hushovd, who we interviewed the very morning after he’d won the biggest race of his career so far. Fair play to Thor, he looked a little bit rough from the celebrating, but he didn’t let us down, telling us how he has evolved away from being a bunch sprinter to more of a Classics specialist. “Maybe it is age, Some sprints are really crazy, I’ve got a daughter and I don’t want to risk my life,” he told us. We’ve got a feeling Hushovd’s going to be a good world champion. Purists may have sniffed at the world championships coming down to a sprint, but it still gave us a world champion who is a very possible Paris-Roubaix winner. We present an in-depth analysis of the 2011 Tour de France route, complete with stage details, a breakdown of each phase of the race, and an expert panel giving their reactions to the announcement. A good Tour de France doesn’t happen until the race is underway and the riders make something of it, but our initial reaction is positive. The uphill finishes in the first week are a nice touch, and the Pyrenees and especially the Alps look spectacular. However, there’s not much for the time triallists, and more seriously, they’ve almost completely bypassed the great wine-making regions. What are we going to do in the evenings? Who was the best rider in the world last year? Fabian Cancellara? Philippe Gilbert, Vincenzo Nibali? Andre Greipel? Mark Cavendish? None of the above, according to the UCI’s World Ranking. 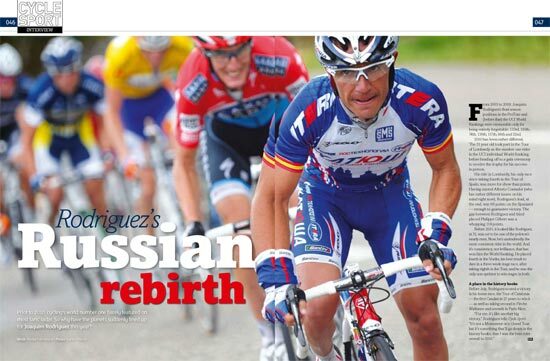 Instead, it was the super-consistent Joaquim Rodriguez, who won the season-long ranking. Alasdair Fotheringham has interviewed the hyperactive, loquacious Spaniard, who talks about his liberation as a rider after leaving Caisse d’Epargne for Katusha. Rodriguez may not have won much in 2010 (The Tour of Catalonia and a Tour stage were the highlights), but look at his results: Sixth in Paris-Nice, third in the Basque Country, second in Flèche Wallonne, ninth in the Tour of Switzerland, eighth in the Tour and fourth in the Vuelta. He may not have been outright the best rider in the world, but he was definitely the most consistent. The nights are drawing in, and Christmas is fast approaching. 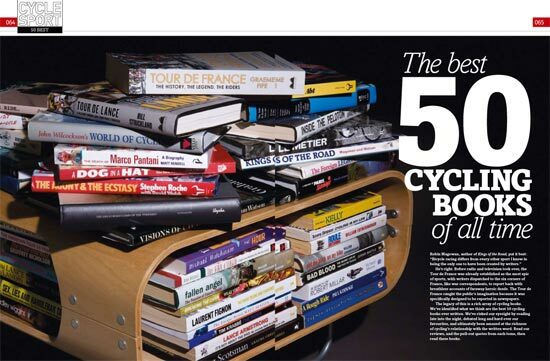 Both good excuses to invest some money in one or more of the Top 50 Cycling Books Of All Time. We’ve found what we think are the very best books about professional cycling, read and re-read them, argued long and hard over which books should be included, then argued again over the final order. We’ve outlined each book, spoken to some of the authors of the best ones and written about some of our personal favourites in the office. What’s number one? Buy Cycle Sport magazine to find out. The Cycle Sport Challenge returns, with possibly our toughest assignment yet. We sent a member of staff, undercover, to work as a podium girl at the Tour of Britain. 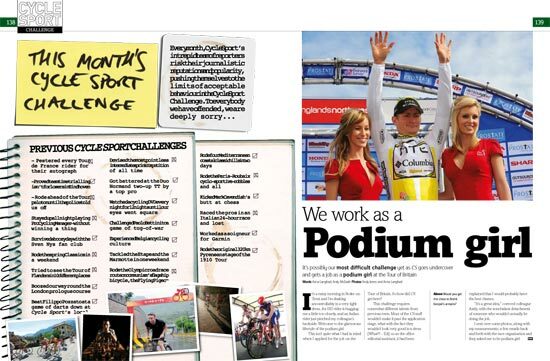 Our Secret Diary of a Podium Girl reveals the dizzying highs (drinks with Andre Greipel! ), and terrifying lows (pervy riders!) of life as a podium girl. Don’t say we never risk ourselves to bring you the inside stories. Our writer Lionel Birnie has interviewed Jeremy Hunt, who looks back over 15 seasons as a professional and shares a series of unique, amusing and insightful anecdotes. Hunt still hasn’t confirmed a team for 2011 – let’s hope the demise of the Cervélo Test Team doesn’t also mean the demise of Hunt’s career. 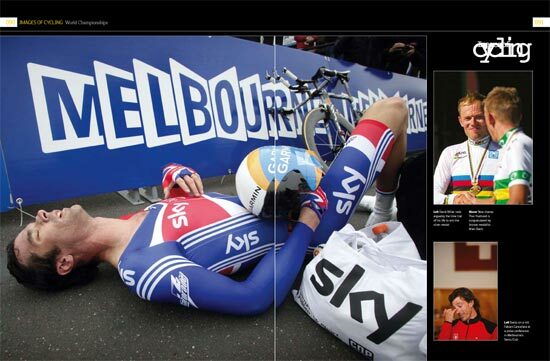 Our 28-page picture supplement, Images of Cycling begins with a 10-page pictorial celebration of the World Championships in Geelong. Our snappers have gone behind the scenes to take some candid portraits and revealing shots of the winners, the losers, and their supporting cast. 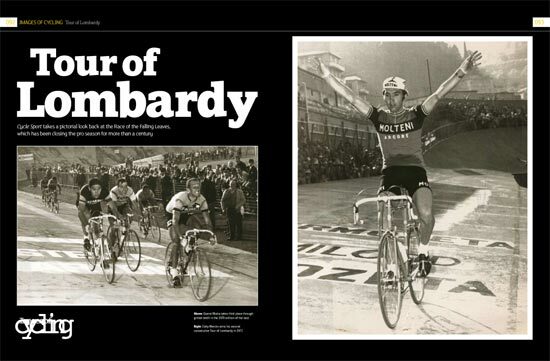 We’ve also taken a look back at the final Classic of the season, the Tour of Lombardy, with a 10 page retro special on some of our favourite editions of the race. We’ve unearthed some beautiful shots, including Eddy Merckx winning solo in 1972, and some rare colour images from the 1983 event, Sean Kelly’s first ever Classic win. Cycling fans are used to seeing the mountains of the Tour in high summer, covered with fans as riders struggle to their summits. 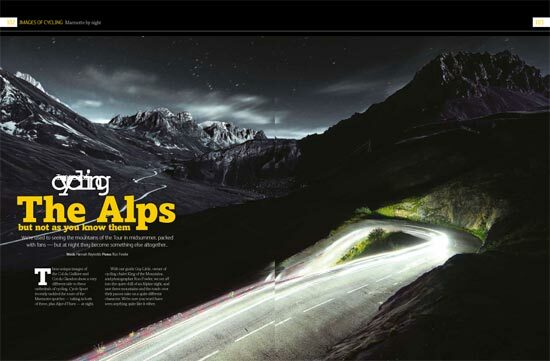 We decided to take some pictures of the Col du Galibier and Col du Glandon on a night-time ride which revealed a quite different character to these famous climbs. 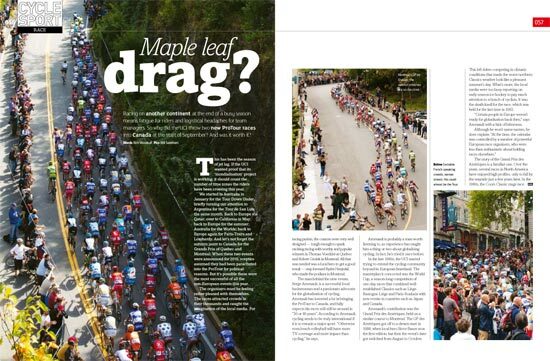 Cycle Sport sent Rich Woodruff to witness the two new Canadian ProTour Events, the GP de Montréal and GP de Québec. As well as talking to the riders, and watching the first ever ProTour events to take place on North American soil, we’ve asked what place these new races have in the calendar. Are they perfect preparation for the Worlds, exciting races in their own right, or an unwanted attack of jetlag in an already busy season? Iconic Places goes indoors for the first time, to the Ghent Kuipke, venue of one of the finest spectator experiences in cycling – the Ghent Six. In a three-way Venn Diagram which contains the circles Beer, Techno Music and Bike Racing, the Ghent Kuipke sits right in the middle, at the intersection between all three. Read our feature to understand why. You can’t open a training manuel these days without being buried under an avalanche of power meter information. Which makes Quick Step’s approach to training a refreshing one. Pro Performance interviews Quick Step’s trainer Luca Guercilena about his preference for using heart rate monitors in coaching his riders. We look at the training and racing of Quick Step rider Kevin Hulsmans as an illustration. We’ve also brought you a unique eyewitness report from Constitution Hill, which established itself as the Welsh Koppenberg in the recent Tour of Britain. Rain, cobbles, a steep gradient and baying crowds – we could have been in Belgium. 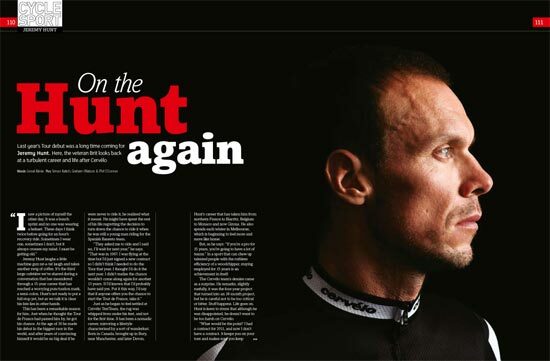 Plus…All our regular features – Shop Window; Graham Watson looks back at the Worlds; Team Issue has a look at Allan Davis’s Astana edition Specialized Tarmac SL3; Broomwagon – Pat McQuaid on a bike, Lance’s letter to the UCI, training with Tyler Hamilton and Bjarne Riis pours his heart out to us; Toto; The Contador Clenbuterol chronicle; Q&A with Gustav Larsson; Mega Omega; Top 10 excuses for doping and much much more. That’s an incredible nine major in-depth features, plus 28 pages of superb photography, and all the extras, for £4.25. Cycle Sport December is on sale in the UK from Wednesday October 27, and will be available later in the US.